Below is my report on the San Diego Comic-Con with a few sample photos from the show. To see the full collection, visit my two photogalleries, divided into the Best and the Rest. Now that I’ve unpacked, tallied inventory and sales, checked online to see what actually happened at the Comic-Con beyond the limited bubble of my exhibitor’s booth, and recovered somewhat from Comic-Con (though not entirely), I can safely say I’ve landed back on planet earth. From a fan and Comic-Con perspective, the show was certainly another success. No matter your pop culture/geek interest, it was all there under one roof: Twilight; Star Wars; Firefly; television ranging from BBC America’s Dr. Who to AMC’s Walking Dead; previews of films like Django Unchained, Oz, the Man of Steel, and the Hobbit; gaming; books; and costuming/cosplay. Now that the convention has hit its attendance limit, the people fortunate enough to attend are now old hands at navigating the show, so I was struck by how generally pleasant and mellow everyone was, even when the crowds and lines seemed otherwise overwhelming. And despite complaints each year about how comics have been pushed to the fringes at its own party with Hollywood’s deep pockets dominating the show, there were nevertheless plenty of comics and comics-related product to be found for anyone so inclined: mainstream publishers like DC, Marvel, Image, IDW, and Dark Horse; indie and small press publishers like myself; artists; boutique graphic novel publishers like First Second, Scholastic and Top Shelf; back issue dealers; and both high end and original art dealers. It’s strange, however, that Comic-Con splits its contingent of comic-book dealers and artists in half by placing them on opposite ends of the concourse, often making it difficult to easily traverse to the other side since the large entertainment industry booths and the crowds they attract sit intimidatingly in the middle. Comic-Con physically outgrew the convention center years ago and has been steadily creeping out into the surrounding area with ancillary events, both official and unofficial, with restaurants, bars and empty storefronts booked for the duration. This year it seemed even moreso—alternative events even welcomed people who were shut out of the show. An article in the Los Angeles Times noted how some people come down to Comic-Con just to attend parties and/or do business without ever stepping inside the convention center. As far as sales, it was a solid but not spectacular showing for me, boosted by my sale of some original art. It’s been observed for several years now that regular comics fans have become an endangered species at Comic-Con—ironically, as the event has become more popular and grown, it’s become more exclusive. Obtaining a golden ticket to the event has become a lottery, with many longtime attendees of Comic-Con squeezed out. It’s been many years since I could automatically assume anyone stopping by my booth was a potential customer who read comics. Of course, in addition to growing my audience, a major reason I continue exhibiting at Comic-Con is because of the fans who have been following the book for many years and make a point of stopping at my booth—sometimes making me their first stop—to say hi and pick up the latest issue. Their ongoing support and patience—especially given the long draught between issues—is amazing and humbling. It was great to see these old friends, many of whose photos you'll see in the photogalleries of this year's show and last. Having said that, foot traffic around the comics areas seemed consistently heavy. But keeping in mind that sales can often vary greatly by exhibitor, the Comics Beat reported that comics publishers and artists reported slow sales, a trend echoed by Tom Spurgeon at the Comics Reporter who has observed “a noticeable diminishing of monied comics buyers” at Comic-Con. Several well known cartoonists even made news by announcing they planned not to return to Comic-Con (or at least have a table). This is the reality of Comic-Con—there is a LOT competing for people’s attention at the convention and one has to find a way to cut through the noise in one's assigned tiny corner of the Comic-Con universe. I’ve never been comfortable as a salesman, but it would be naive to think that the quality of the work will sell itself—indeed, I attribute my improved sales of the past few years to my willingness to be a bit more proactive (aggressive is too strong a word) in getting people to simply stop and look at my book. 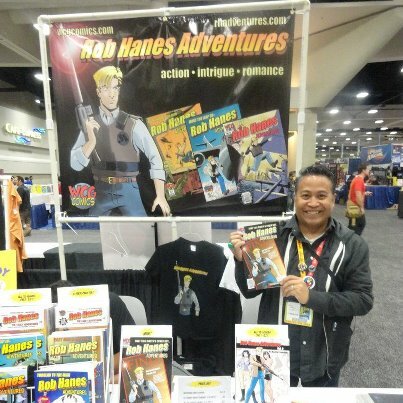 Occasionally, people do still drop dead in their tracks when they see my booth then walk over with the kind of excited look that says my work is the comic-book series they’ve waited for their entire life, but these experiences are fewer and far between. I often wonder how many people attend Comic-Con who might otherwise latch onto my series but never see my booth due to the sheer size of the show. Perhaps one of my most surreal moments at Comic-Con this year was actor Shia LeBeouf hanging out his shingle at the small press booth immediately behind me to give away free copies of his own self-published book, something he had done at another comic-book convention earlier this year. I noticed some activity and commotion at the booth behind me and, wondering what small presser rated that kind of attention, decided to take a look for myself and saw the actor. Noticing he was handing out his book and taking pictures with fans, I asked my wife if she wanted a picture with him, resulting in the photo at right. After a surprisingly quiet lull, the crowd suddenly turned into a mob, with my booth and me now part of the security phalanx around the actor. As soon as he ran out of books, security whisked him away. But perhaps even more surreal than that was having dinner one table over from actor Larry Thomas—best known as the Seinfeld show's Soup Nazi—and his family at the restaurant on site at the hotel where I stayed. (No, I didn’t know his name, I googled him a few moments ago to preserve some of his dignity.) He likely was at Comic-Con to sign autographs. Also saw actor Seth Green and Simpsons’ creator Matt Groening on the floor. Also saw DC co-publishers Jim Lee and Dan DiDio relaxing at the DC Comics booth early one morning before the start of the show. Because I’m primarily attending Comic-Con as an exhibitor and not a fan, I rarely go to any of the panels anymore (aside from some occasional panels targeted at publishers), let alone the larger entertainment industry presentations. Having said that, this is the first time I recall that I never stepped foot inside a panel room while at Comic-Con. I would loved to have attended the Warner Brothers’ panel which previewed the upcoming Man of Steel Superman re-boot and the Hobbit where director Peter Jackson appeared, joined by actors Martin Freeman, Andy Serkis, Ian McKellan and Elijah Wood, but that was a three-hour session that likely would have required standing in line all day. (As it was, I heard people began lining up the night before.) My brother attended a DC Comics panel that Quentin Tarantino crashed (apparently to the genuine surprise of DC as well) in order to prematurely announce a book he was doing with the company based on his upcoming film, Django Unchained. I do occasionally roam the floor on breaks (usually with one or both of my children) to check out the booths, but I always feel I should get back to my booth to sell! I didn’t pick up much, aside from an advance copy of Love and Rockets. Although I'm generally stuck at my table, Comic-Con is nevertheless an opportunity to re-connect with fans and fellow pros, so it was a thrill to see old friends like Batton Lash and Andrew Pepoy. Another highlight was having Scott Shaw!, another longtime professional friend and colleague, draw on my son's armcast, which he was wearing after receiving a minor fracture on the first day of summer camp when he fell off the monkey bars. I know Scott to be a great guy, but I was still struck by how delightful he was with my little boy in talking to him and pattering as he drew a SpongeBob drawing on his cast. When my wife later saw Scott and thanked him, he sunnily replied, "That was easily the best thing I did all day!" Speaking of my children, I must say that Comic-Con has become incredibly family and child friendly both through its programming and exhibitors. While comics has traditionally always been considered a children’s medium, in actuality Comic-Con was predominantly a nostalgia and fan-based comics show at its start before it became a mainstream consumer show extravaganza. Catering to children was really not its focus. But the explosion of good quality and quirky animated television shows (like Avatar and Adventuretime) and films that appeal to both grownups and children, and the explosion of books and, particularly, comics and graphic novels geared towards children and young adults (like the Harry Potter series) by numerous publishers, particularly Scholastic, have really expanded the scope of Comic-Con. As the L.A. Times has noted, it’s led to an interesting clash of tastes and cultures on the floor. But this is Comic-Con and it's all good, right? Below are a small sampling of photos from Comic-Con. To see more, visit my two photogalleries, divided into the Best and the Rest. All my previous posts about this year's Comic-Con can be accessed here. 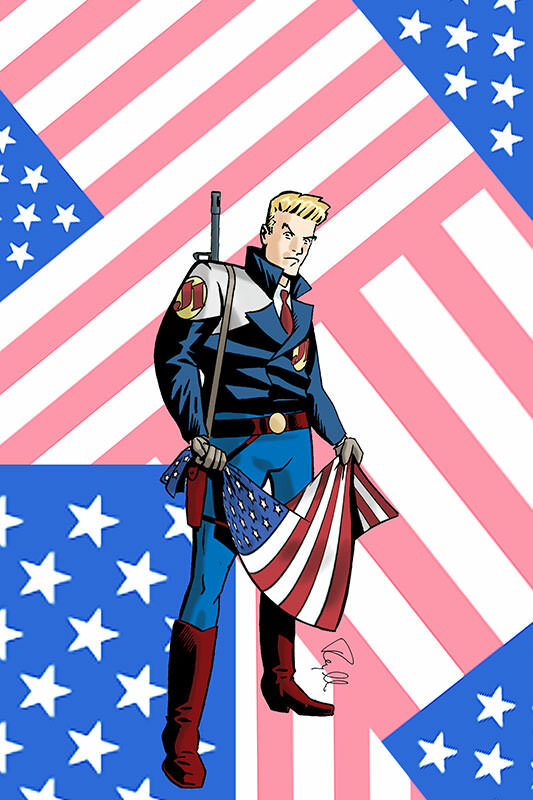 Reports and photogalleries from 2011 and earlier may be found at the WCG Comics website. I stopped by and purchased your books--the three combo sets. I'd gotten some of your digest sized Hanes years ago. Good to see you hanging in there. You might want to try the Phoenix Comic Con some time. Great seeing you again, Randy! Glad you had a good show!